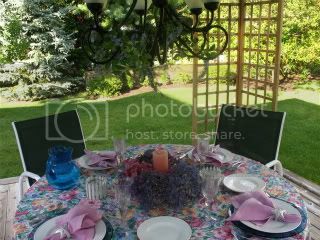 Barb at Grits and Glamour is hosting a porch and patio party. I know Barb from when she posted on HTE a forum where I used to post. And I am also joining Diane from a Picture is worth 1000 words, for Second Time Around Tues. 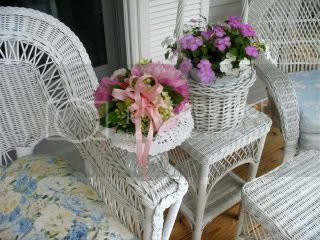 Here on the east end of Long Island, it is still too cold to sit on the porch..so I will show you pics from last year. I have a wrap around porch, so in the mornings we have our coffee on the front porch.. When we built this house 8 years ago, dh didn't want a porch, but I persisted, and he agrees it was a good choice.. It is very old, it has springs and is HEAVY. The ottoman for the matching chair opens for storage. When the sun gets to hot in the front, we move to the back..I have ceiling fans in the front and back...they are a little noisy though, sometimes it sounds like "incoming" like on MASH, but it keeps it cooler and the bugs have a hard time in the wind! We keep a small frig there for cold beverages, and I cozy it up with rugs etc...I will take better pics this year...I wasn't a blogger last year, so didn't think to take pics when it was all set up..Who knew?? 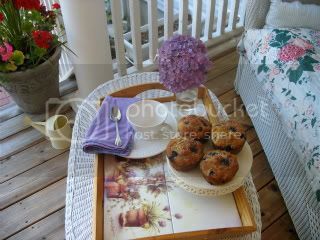 We love the porch, very peaceful..and it is just a short walk to the beach.. Thanks for coming, and please visit Barb and Diane for other entries..
See you for Outdoor Wednesday I hope! LOVE wrap-around porches and yours is just gorgeous! So many lovely spaces to enjoy. Thank you for sharing your pics. when we built our house 3 yrs ago...I too insisted on having a wraparound porch to DH...Now, he too thanks me for having done so. I'd trade all the wild life here, to be close to the ocean..I would love that...lucky you. Your place looks beautiful..but I'm not surprised! Free is always good. I would love to be that close to the beach. Beautiful. Oh how I envy your porch. It's one thing I couldn't find here..along with the other things we were looking for. If I ever build or buy another I will definitely insist on a porch!!! Yours is my ideal with the wicker. I remember cutting pictures out of magazines of wicker pieces when I was a teenager. Love your posts Kathleen..you have a beautiful home. Hi Dishnut! :-) You know, I want to say I thought your home was an older home and was going to ask you how old it was. I mean that with the greatest of compliments. It's lovely, and I heart your wrap around porch. There is nothing better than sitting on the front porch watching life go by is there? And to be so close to the ocean must be wonderful. I wish I could send you some of this beautiful Southern sunshine to warm you up so you could enjoy your porch sooner. Thank you for joining in today's Patio Party. I am going to make it a monthly event. I think every woman alive dreams of having a wrap around porch. Oh, my...your's is so so pretty. Thanks so much for preparing this lovely post...I enjoyed it so much. You have a beautiful home and porch! Kathleen, it's all BEAU. You have such a nice place to relax and enjoy. And the beach so close...nice! Kathleen, your porch is gorgeous. What a find that little chair was! Wow, that's a great porch. Glad your hubby agreed to put it in! 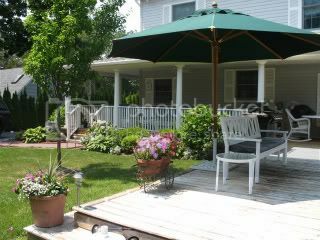 Love your home and that awesome porch with such pretty wicker furniture! Wow!!! I love your porch and deck. What a beautiful relaxing setting. 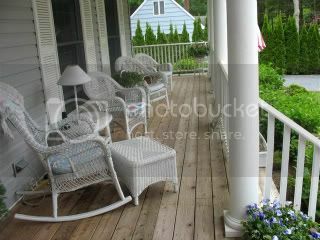 Hello Kathleen, Your porch is so pretty and I adore the wicker on the frot of the house and the deck. How lucky to get that gorgeous furniture. Your home and neighborhood is lovely. Thank you for sharing it with us today. 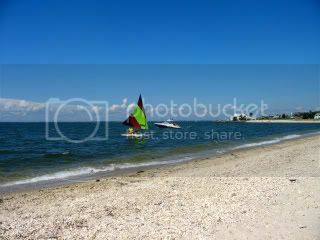 I invite you to drop by for a visit (at the above url)as I also celebrate the blogland event 2nd Time Around Tuesday. I am delighted to hear that your dh :) has determined that your porch addition was a good idea! It would be hard to imagine not having that sweet spot to enjoy your coffee and other goodies! 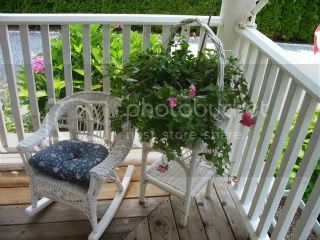 Kathleen, This is such a stunning porch! Immediately when I saw the white wicker chairs on it I knew I would fall in love with the rest! ;) Stop by for my blog giveaway! The deadline for the closing is May 10, midnight, PDT. I'll be posting winners on Monday. More than one chance to enter! 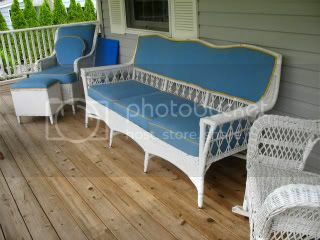 ;) ~CC Catherine from "Catherine de th`e Cup"
I'm in love with your porches & all the white wicker. The little kiddy rocker is too cute. Fabulous pieces, fabulous porch. What a wonderful place to loll about and read a cookbook, all the while sipping mint tea and eating one of your many delicious desserts. Thanks for this beautiful glimpse. What a beautiful wrap around porch - I just love it. 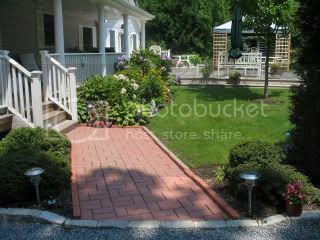 I spent some time gawking at the porch and the beautiful landscaping surrounding it. 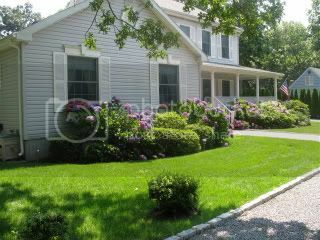 How wonderful to sit and look out on such a gorgeous yard too. I love ALL of your wicker pieces but that little chair for the grandkids is the cutest thing ever! It looks to me as if you have successfully secured your own little piece of heaven! Thanks for sharing your pictures! 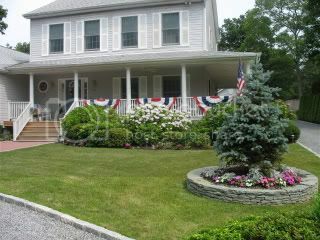 Super post - love the wrap around porch..makes the house, couldn't imagine it without one. Kathleen, this is so beautiful. I love this area. You always have the loveliest posts. The wicker rocker for the grandkids is wonderful ... I'm not surprised that they fight over sitting in it.